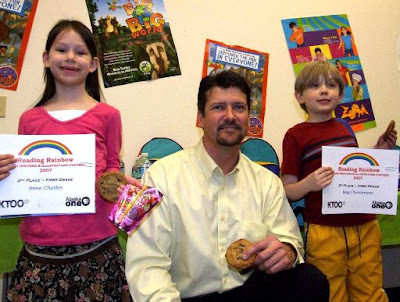 Above is a picture of Todd Palin from May 2007 giving awards in the 13th Anual Alaska Reading Rainbow Young Writers & Illustrators Contest (article and pic here). It's amazing to see what type of buzz and energy the vice presidential nod of Sarah Palin has given the McCain campaign. Today I heard the most recent poll had McCain in the lead over Obama. I still maintain that the Palin family's life is the material of TLC-style reality TV. But the one thing that has surprised me is that I haven't heard more people talk about Todd Palin. Obviously the McCain/Palin campaign has praised Todd as an average, hard-working Alaskan guy who works in the fishing and oil industry and is also one amazing snowmobile racer. And ever since Palin has received the nomination there has been talk of her role as a mother, especially with young children, one with special needs, and a pregnant 17 year old daughter. Yet...what I haven't heard is talk about Todd Palin. Maybe I've missed it, but who's talking about his role as a father? When liberals, conservatives, evangelicals, and everything in between criticize Sarah's busy life do they ask whether or not Todd will be able to be involved in the life of her children? Do people ask what role Todd will play if Sarah is the next vice president of the United States? 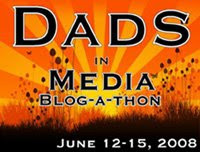 One of the things I really enjoyed about putting together that Dads In Media blog-a-thon this past summer was finding all these different dads who were passionate about the fatherhood experience, with a deep passion to be involved in the life of there children. Especially as more families have two working parents (or occasionally working mothers and stay at home dads) the role and opportunity of father hood has really opened up. While both campaigns have stated a "truce on families" in this election, both campaigns have used their families to connect with people, and create a personality and identity in their campaign. If Sarah Palin is the next vice president, I look forward to learning more about Todd Palin, and his role, and will be interested to see how that is perceived in the public spotlight. If I had one question for Todd Palin, I would ask...If the McCain/Palin ticket wins in this upcoming Presidential Election, what would you hope to accomplish over the next four years, politically and within your own family? What question would you ask Todd? I'd ask, "who in the world came up with all those nutty baby names?" "That's nice, Todd, but my question is: Can you get 'r' done?" on a sad side note, i did find a critique of the family roles in the palin family that both infuriated and deeply saddened me. I just wish we knew more about these people. What can we really learn in a couple of months. I would ask "Tell me about yourself and your family" and just sit back and hopefully learn something that would give me a clue who these folks are. Good piece. I'm not sure that I know much about Todd Palin, but I think the sight of a first dude sitting with his children, and holding Trig is a sort of breakthrough for involved dads. Could be a great role model, showing you can you can be a successful oil worker, a world champion snow machine racer, and at the same time nurture your kids. From what I've heard so far, it sounds like he's a very involved father, who is also secure enough to be completely supportive of his wife. And he's a snowmachine racer, a hunter, a commercial fisherman, and works in he oilfield. The sort of guy that Barack Obama couldn't be even if he spent the whole summer at Man Camp. I was able to view his interview with Greta from FOX last night. He was impressive. He is the type of husband a lot of women would love to have.